The most current kalk issue was not nearly as bad as the previous one. Last time I lost 95% of my SPS corals, where this time I only lost 2 – though some of them are going to take a month of so to recover completely. When I caught it, the pH in the tank was 9.7, bad but not immediately kill everything bad. 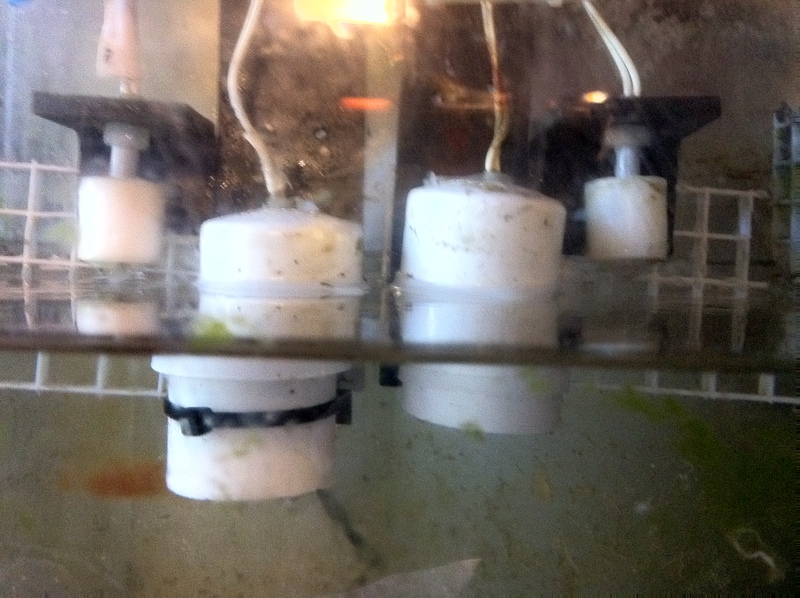 My sump is essentially a 180 gallon tank so when the primary float switch failed about 15 gallons of yummy kalk water was pumped into the tank until the secondary float switch, located about 3 inches above the primary clicked into action. This time, instead of dumping gallons of vinegar in the system to lower the pH, I tee’d off of the CO2 feed to my calcium reactor and bubbled CO2 directly into the display tank. CO2 is better for a couple of reasons, the most important being the lack of bacterial bloom that results from gallons of vinegar being dumped into a saltwater system. Since the system wasn’t totally crashed, this was very important to me. Another good thing about the CO2 addition is that its effect of lowering pH is very fast and its hard to overdose – just take line out of the tank. Getting the pH down to 8.2 took less than 10 minutes, and the change was startling. Fish that were clearly stressing and hiding came right out and ate. A Linkia starfish that looked to be dead, perked right up. LPS corals started opening up within 30 minutes. I like the CO2 much better than vinegar. Of course, it should be obvious that CO2 can be dangerous for both your tank and you, so be careful and I wouldn’t even think of doing it without a calibrated electronic pH meter. So what did I do to avoid this avoidable problem in the future. First, I further slowed the amount of water pumping into the system via the Auto Top Off. I also put the ATO on a timer with an on/off cycle of 30 minutes. The system can still move enough water to keep up with top off, but it takes time to fill it up, and that less time means more time before the problem becomes critical. The second thing I did was reconfigure the sump equipment so it was all easier to get to and maintain. Easier and neater means faster and better regular maintenance. Now, the switches are right up front, in a dark space and soaking them in vinegar takes a matter of minutes. Easy peasy. I also modified the way the float switches were laid out. Now, instead of 3 inches between primary and secondary float switches, resulting in a 15 gallon addition, there is about .5 inches, resulting in a 3ish gallon addition before the secondary kicks in. Its such an obvious modification that I marvel at my lack of making it immediately upon receiving the float switches. The third and most important think I did was set up a 4 month recurring calendar event on my computer to remind me to do the regular cleaning.